Compared with some of the great spiritual "luminaries" of our own time, this may seem a bit unpastoral, but nevertheless, just as St. John has a homily for Pascha, he has a homily for Holy Thursday. Unfortunately, this homily is not heard by nearly so many people, because this service is not nearly so well attended, and it is often not read even for those who do attend... though it should be. O my beloved and greatly-desired brethren who have gathered in the Holy Church of God, in order to serve the Living God in holiness and righteousness, and, with fear, to partake of the holy, most-pure, and immortal, awesome Mysteries of Christ: Hearken unto me who am lowly and unworthy. 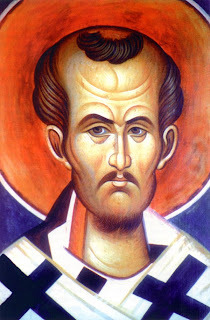 For it is not I who am speaking to you and instructing you; rather the grace of the Most-holy and Life-giving Spirit; for I speak not from myself, but as I have been instructed by the divine canons, and the God-bearing Fathers, as the Church received instruction from the divine Apostles who received their wisdom from God, so do I myself speak, who am lowly and least of all. I know not your works; I consider not that which you have begun; and so, as one who fears God, I give counsel to everyone among you, whether man or woman, whether great or small, to anyone of you that may be guilty of sin, convicted by your own counsels, that first you must repent and confess your sins, that you may dare, considering yourself unworthy, to approach and touch the Divine Fire Itself. For our God is a consuming Fire, and they, therefore, who with faith and fear draw near to the God and King and Judge of us all, shall burn and scorch their sins; and It shall enlighten and sanctify their souls. But It shall burn and scorch with shame, the souls and bodies of them that draw near with unbelief. Therefore, many among you are ill and sleep in sickness, that is, many are dying unconfessed and unrepentant. And furthermore, my brethren, I beseech you, and I say: no one that swears oaths, nor a perjurer, nor a liar, nor one that finds fault with others, nor a fornicator, nor an adulterer, nor a homosexual, nor a thief, nor a drunkard, nor a blasphemer, nor one that envies his brother, nor a murderer, nor a sorcerer, nor a magician, nor a charmer, nor an enchanter, nor a robber, nor a Manichean, shall, unconfessed and unprepared, approach, touch, or draw near the dread Mysteries of Christ, for it is terrible to fall into the hands of the Living God. For the Word of God is sharper than any two-edged sword, piercing even to the joints and marrow and bones, and thoughts and hearts. See, therefore, my brethren, that no one approach, unrepentant or unprepared or unworthily, to partake of His dread and most-pure Mysteries. For He Himself saith: I am He, and there is no god besides me; I kill, and I make alive; neither is there any that can deliver out of My hand; for I, Myself, am King forever: to Whom is due all glory, honor, and worship: to the Father, and to the Son, and to the Holy Spirit, now and ever, and unto the ages of ages, Amen.